Researchers from City University London are helping protect journalists around the world whose lives are threatened as a result of their job â to report on matters of public interest. In recent years journalists have become the target of a disturbingly high number of physical assaults, including murders, and of many forms of intimidation including judicial harassment by state authorities and wrongful imprisonment. 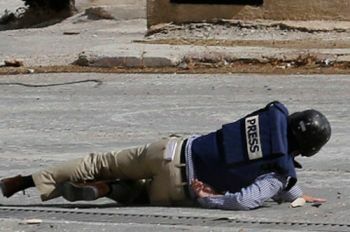 In a disproportionately large number of cases where journalists are the victims of attacks or murder, the offenders are not identified and the crimes go unpunished. The initiative on Journalists in Danger: Impunity and the Rule of Law was established in 2010 as a joint project between City University London's Centre for Law, Justice and Journalism (CLJJ) and the University of Sheffield's Centre for Freedom of the Media (CFOM). It was set up to provide an independent platform to assess the effectiveness of existing legal, political and institutional safeguards against violence directed at journalists; and to present the case for more effective international mechanisms to counter such crimes of violence and to end impunity. The Initiative is directed by Professor Howard Tumber from City and Professor Lorna Woods (formerly from City and now at The University of Essex), in addition to William Horsley and Professor Jackie Harrison from the University of Sheffield. The Initiative has had a major impact on policy and influenced international legislation and NGO practices concerning human rights, freedom of information and protection of journalists. Its ground-breaking work along with other campaign groups has contributed to the adoption of the United Nations Plan of Action on the Safety of Journalists, the Issue of Impunity in 2010 and Implementation Strategy 2013-2014. In another strand of research, Professor Woods and Dr Carmen Draghici produced a study called Safety and Protection of Journalists: A Responsibility for the World, which aimed to identify the root of the phenomenon of impunity for violations of journalists' rights, and suggest possible courses of action. Dr Cecilia Dinardi has also produced a comprehensive database detailing key organisations in the protection of human rights, freedom of information and safety of journalists, and proposed ways to enforce journalists' rights and to protect them even in states where judiciaries are weak. In June 2011 the researchers put on the 'Working Conference of the Initiative on Impunity and the Rule of Law'. The event, which was held at City, was attended by many stakeholders including senior members of international and intergovernmental organisations such as UNESCO, journalists' federations and expert NGOs. 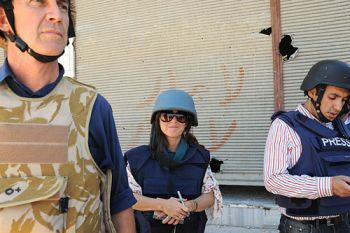 These include Amnesty, Reporters without Borders and the Red Cross. The conference also had the support of Archbishop Desmond Tutu, a long-time advocate for the worldwide protection of journalists' rights. The Initiative has had a major impact on policy and influenced international legislation and NGO practices concerning human rights, freedom of information and protection of journalists. The conclusions drawn from the meeting were then presented at the UN Inter-Agency Meeting in Paris and the Initiative made some recommendations which contributed to the UN's decision to establish an inter-agency mechanism to monitor progress and assist countries in the development of legislation favouring freedom of expression. In addition to the conference, the Initiative has also created an international platform of academic and legal expertise comprising governmental and non-governmental experts from organisations (including International Bar Associations, the UK House of Lords, the UN, Media Legal Defence Initiative and International News Safety Institute) to seek acceptance for fighting violence against journalists and the right of citizens to be informed. Professor Ivor Gaber, Professor of Political Journalism at City has played a key role in the Initiative making use of his role as the UK Government's representative on the Intergovernmental Council of the UN's International Programme for the Development of Communication based at UNESCO. Professor Gaber persuaded the Council to direct UNESCO to convene a meeting of all UN agencies to draw up and implement a plan to increase journalists' safety and hold governments accountable for the impunity provided to their assailants. As a result the UN Plan of Action on the Safety of Journalists and the Issue of Impunity was endorsed by the UN Chief Executives Board in April 2012, the United Nations General Assembly (UNGA) adopted the Resolution on Safety of Journalists and the Issue of Impunity at its 68th Session in December 2013. This led to the creation of The Implementation Strategy on United Nations Plan for the Safety of Journalists and the Issue of Impunity 2013-2014. This strategy combines efforts to promote a free and safe environment for journalists in both conflict and non-conflict situations. The Initiative continues to conduct research and consult academics, legal experts, national government officials, Inter-Governmental Organisations, and media representatives, with the aim of strengthening existing mechanisms for increasing co-operation and preventing attacks against journalists. The Initiative's work has been made possible thanks to funding from the Open Society Media Program, the Centre for Freedom of the Media at the University of Sheffield, the Swedish National Commission for UNESCO and the government of Norway (via Norwegian PEN). Safety and Protection of Journalists: A Responsibility for the World, by Dr Carmen Draghici and Professor Lorna Woods.